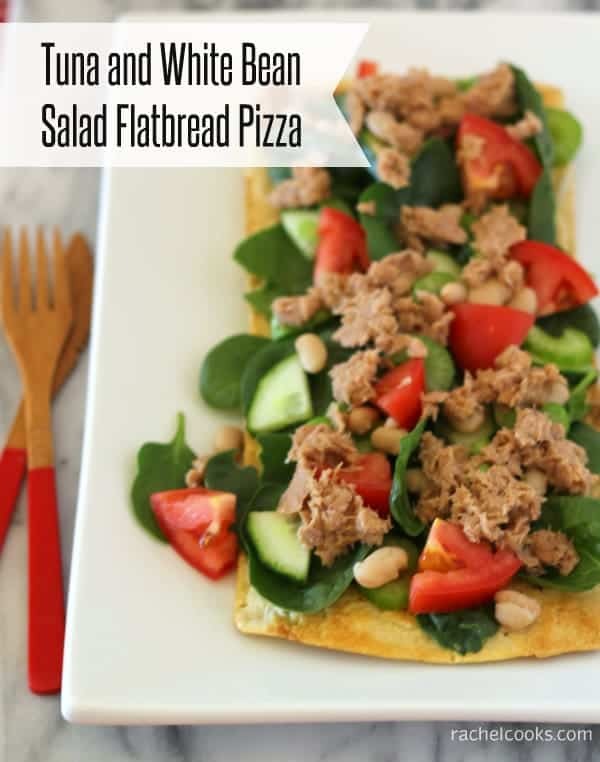 This tuna white bean salad flatbread is a pizza you don’t have to feel guilty about! Filling, flavorful and fun to eat — and unbelievably easy to prepare. I’m so excited to be teaming up with Flatout Flatbread and StarkKist to bring you this healthy and filling recipe. This flatbread pizza is very unique and light — but filling at the same time. You guys are going to love it. My husband loves tuna. He ate it all the time when he was in the Marines. When he was a teacher, the staff of the school all contributed to a school cookbook for fundraising purposes. If he can eat it like that, it is clear that he loves tuna. Me…I’m a little iffy on it but like it when it is prepared in certain ways. And you all already know I love Flatout Flatbread, so I’m excited to partner with them for this post. I showed you that in my egg wrap and also my vegetarian wraps. I use one of Flatout’s products practically daily and love that they are a Michigan company. The flatbread crust that I used only has 140 calories and the herb and garlic tuna packet only contains 110 calories! The herb and garlic tuna is so flavorful that you barely need dressing so I just spritzed the spinach with a light spray of extra virgin olive oil for a little moisture and flavor. The white beans lend such a creamy texture that you won’t even miss the mayo and cheese that often accompany tuna. 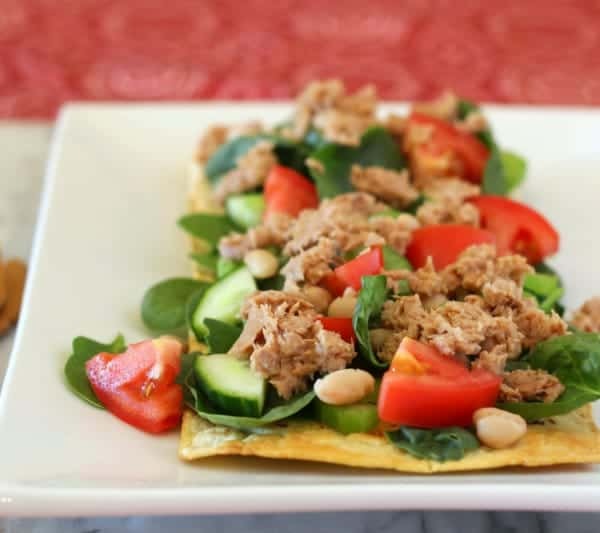 We are definitely having this tuna white bean salad flatbread again — and soon! Ben said “I could eat this every day!” For E (my 3-year-old), I baked a Flatout flatbread pizza with tuna and a light sprinkle of cheese. She loved it! This is a pizza you don’t have to feel guilty about! Filling, flavorful and fun to eat — and unbelievably easy to prepare. Preheat oven to 350 degrees Fahrenheit. Brush or spray flatbread lightly on both sides with olive oil. Bake for 8 minutes or until golden brown and crisp. Disclaimer: I received products for recipe creation as well as a Target gift card. All opinions are always my own. I’m not even kidding, I sent Flatout about 4 Twitter messages asking them if they wanted to work with me because I love their products so much. Perseverance pays off — ha! I’m not a creative cook – so I would have a tuna salad sandwich. i really want to try making a tuna melt with my flatout bread — i have a pack in the fridge! i’d make a tuna wrap! I would make a white pizza with tuna, onion, garlic and green peppers (thinly sliced). I would love to make a tuna melt! I would make a grilled tuna and cheese. I’d make a tuna salad wrap. i would make a wrap with peppers and onions added! I would make a tuna wrap with avocado. Thank you! I to like to mix the tuna with mayonnaise, sliced apples and sultanas the wrap in a Flat Out for a delicious lunch! Sounds like an odd combination but it is delicious. I would make a basic tuna salad the 1st time I used Flatout flatbread, when it gets everyones approval I’ll get creative. I would make tuna salad. I would make a tuna guac salad wrap! I mix the 100-calorie Wholly Guacamole packets with a serving of tuna and some salsa or spicy red pepper relish with a dash of hot sauce…I usually eat it as is, but it would make an awesome wrap on some Flatout bread. I would add jalapenos and cheddar cheese! I would make my tuna salad and spread on the flatbread. Then I’d slice some beefsteak tomatoes and put the slices on top with some salt and pepper. I would make a flatbread wrap with Tuna salad, lettuce, tomato and cheddar. I would make tuna melts with thousand island dressing and Starkist Tuna on a Flatout Flatbread these are so good. I love flat outs! I use them all the time instead of bread for sandwhiches. My fiance is a big tuna guy – sometimes I make him tuna fish sandwhiches – er wraps rather – using the flatouts. I must try this recipe too! I’m not normally a fan of fish, but oh my goodness I am all over this recipe!! I’m not a huge fan of fish either! But the herb & garlic flavor definitely helps! This looks like the perfect thing for lunch! YUM. Tuna melt for sure ….. I would make a tuna flatbread melt! I would make a flatbread with the tuna, scallions, maybe bean sprouts drizzled with a soy ginger dressing. 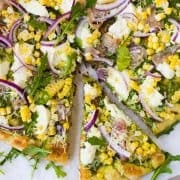 I would make a tuna salad pizza with ricotta and basil! I like the idea of trying to make a mediterranean pizza. I’d make a tuna and guacamole wrap. I’d make my favorite tuna salad and eat it on the flatbread! I use mayo, craisins, dill, tarragon, walnuts, flax seeds (ground or whole), cheese (colby or cheddar), and will eat it plain or on a wrap or sandwich. It’s SO delicious! I would make a tuna melt on whole wheat flatout! I would make a tuna wrap!! YUM! I’d make a tuna salad wrap. It’s one of my favorite lunches! Starkist has a ranch Tuna Creation?!? Awesome! 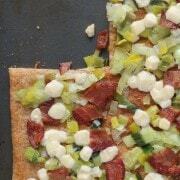 I’d try the StarKist Buffalo Tuna Flatout Thin Crust Pizza. Looks delicious! I’d try this recipe – it sounds great. I would make a tuna salad sandwich on flatbread. I’d start with the recipe you posted…quick to make and looks delicious! Probably a tuna salad with avocado and use the flatbread as dipping utensil. A tuna salad wrap would be great ! 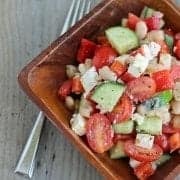 I like the other commenters’ suggestions for tuna melts, but I think I’d do a traditional tuna salad with some nice veggies, much like your recipe (which looks scrumptious!). I would make the Flatbread recipe you just posted! What a great recipe! I agree with Ben, though too–anything with mustard is a great meal. Thanks for the recipe and giveaway! I would make a Mediterranean Tuna Wrap. Yum! I love tuna casserole. I would replace the noodles with the Flatout Flatbread, as a crust, and bake it. 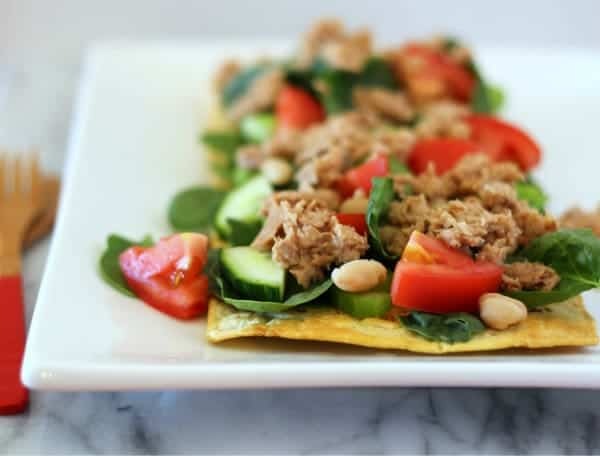 I would make your Tuna and White Bean salad pizza. Oh yum- I would probably do a taco pizza type dish. This looks good but I think I would first start with a tuna melt! I’d make this! It looks delicious and I’m trying to drop some weight, so it would be perfect! I would make a tuna salad blt pita. Love how light and fresh this is! I would make an open-faced tuna melt! I would make a tuna salad wrap! I would make my tuna salad, spread it on the flatbread and maybe cut it into cracker size pieces, I would put out some olives, pickles, tomato, avocado, etc so people can garnish their crackers however they like. I think this would make a really nice starter for a dinner party. I’d make a tuna melt! I would make tuna apple wraps. tuna melt for me, love them! I like tuna and the bread looks yummy. I would make tuna cheese quesadilla, easy on the cheese of course. Black beans instead of white beans. I would make some sort of tuna melt – yum! A tuna melt. I love them! A tuna rollup with cheese and veggies sounds perfect for lunch! I’d probably make a tuna melt! I would mix up some Tuna Salad and serve it on the flat bread along with some lettuce and tomato. I would make a tuna melt flatbread. I would make something delish for my husband’s lunch! I’d make a tuna salad pita–yummy. I may look for that deal at Target later, too. Thanks for the heads up! I LOVE Flatout’s flatbreads! Thanks so much for hosting the giveaway! I’m thinking I would make a spin off of a Nicoise salad…maybe with a little balsamic drizzled on top!